You know the old wive’s tale that when you’re sick you should eat chicken noodle soup? It’s not actually an old wive’s tale. It’s totally true. There have been numerous studies since 2000 that have concluded that grandma’s chicken noodle soup actually does help shorten the duration of a cold. Of all the ingredients in chicken noodle soup that may help with your sickness, noodles, sadly, aren’t one of them. Move over noodles, and let’s welcome quinoa to the picture. 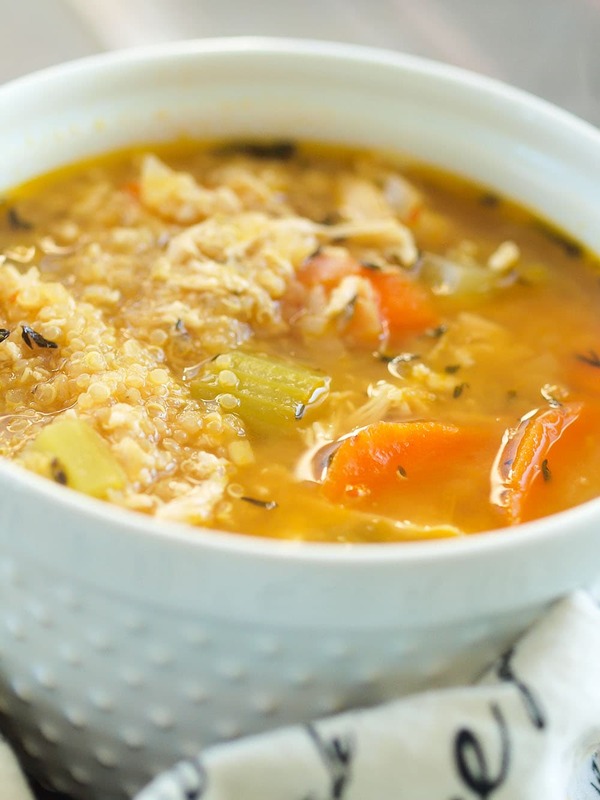 This Chicken Quinoa Soup is an updated version of your favorite classic soup. All the flavors of chicken noodle soup are there, but healthy quinoa takes the place of noodles, and we love it just as much. If you can, I highly recommend you make your own bone broth. Homemade bone broth has so many health benefits, including boosting your immune system, helping your liver function and detox, improving your bone and joint health, and improving digestion. I don’t usually have large chunks of time to simmer my broth, nor do I like keeping my gas stove on all day, so I like to make mine in the slow cooker. It’s so easy to just dump everything in and let the slow cooker work its magic! Not only is homemade bone broth more nutritious than most store-bought varieties, you’ll save money making your own, too! Whether you make your own broth or not, I hope you will give this Chicken Quinoa Soup a try! It’s such an easy recipe that is perfect for these cold winter days. 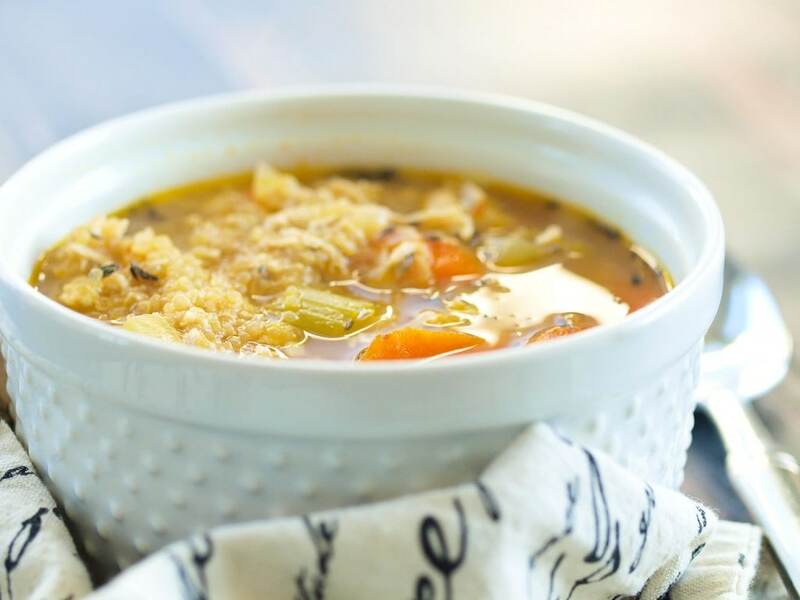 This Chicken Quinoa Soup recipe is an updated classic. Ditch the noodles for healthy quinoa! In a large stock, heat the oil over medium heat. Add the onion, carrots, celery, garlic, the bay leaf, and thyme and cook, stirring occasionally, until the vegetables are just softened, about 5 minutes. Add the chicken stock and quinoa and bring it to a boil. Reduce the heat and simmer until the quinoa is cooked, about 15-20 minutes. Stir in the chicken and allow to cook a few minutes, until the chicken is thoroughly heated. Remove the bay leaf before serving. Enjoy! Could you do a post on homemade bone broth/whole chicken in the slow cooker? Would love to make it! This is such a great idea to use quinoa in place of noodles in chicken soup! This soup looks so warm and comforting! We have been wanting to try adding quinoa into our diet. This recipe would be a great start! This would be a great recipe to start with–familiar flavors with just a different texture! I hadn’t heard of Quinoa before. Your soup looks soooo good! I will try just about any recipe that is healthy and looks this good! Do you think this would work in the crock pot? If so, how long would you cook it for? Definitely! My best guess would be to cook on low for 6-7 hours. I’d say start with raw chicken and then take it out and chop it or shred it before serving OR add the already-coooked chicken at the end. I wouldn’t let already cooked chicken cook in the crackpot all day or it will be totally dried out. Let me know if you try it! Made this last night & it was yummy! Had not thought of the noodle & quinoa swap……perfect! I’d also love a post on bone broth. Seen it all over the place but not sure how to do it & what the benefits are. Do you know what the calories per servings are in this recipe? Hi there! Thanks for your question. 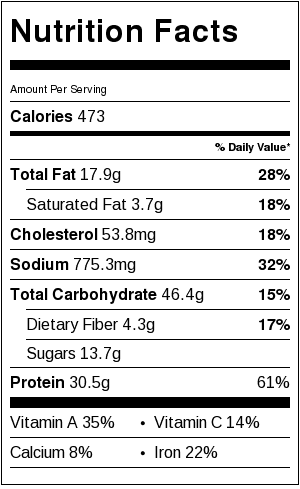 I just added the nutritional information. It’s 473 calories per serving. A serving is approximately 2 cups. I make a lot of chicken soup including an old Jewish chicken soup recipe, but this one is one of my favorites. I don’t know if it’s the addition of quinoa that makes it so yummy or the fact that it doesn’t take so long to make, but it is so good and healthy. Thank you for the recipe. I made this for my family last night and we all loved it! Great recipe, Maryea. I just shared it on my Facebook page. I’m glad you like it and thanks for sharing! This recipe looks delightful, very eager to try it. 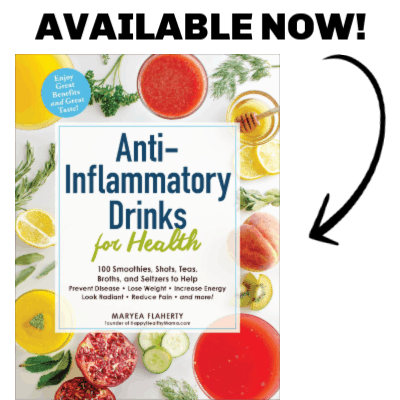 Its perfectly suitable for anyone who is into “clean eating” , as my family and I are. Its always great to have another great soup recipe to add to our menu. The only change I will personally make it to swap out regular salt for much healthier sea salt or Himalayan salt, in order to really keep it compliant with a healthy, clean eating lifestyle. Thanks, looking forward to perusing other recipes on your site! This was yummy! I just had some leftovers and it really hit the spot. Perfect soup for when you aren’t feeling well. I’m a blog writer, and I’m currently working on a round up of “Favorite Healthy Soup Recipes” for my client, Avocado Green Magazine. I would love to include this recipe in the round up. May I have your permission to share one of your photos and direct folks to your website? Please note, we will NOT be sharing your entire recipe, just sharing a photo and direct link to your site. I know our readers will LOVE this! Your recipe sounds yummy, but you have SOOOO many ads and pop-ups (follow you on instagram, allow push notifications, etc.) that I just can’t share this recipe with my social media friends and fam. I understand monetization, but I think you’ve gone too far overboard. It’s a shame, because I would’ve not only shared this recipe, but would’ve explored your others as well.